While the Bengals struggled most of the night in protecting their quarterbacks, there were some highlights for the Bengals offense. Brian Hill hauled in a few nice receptions out of the backfield while Tra Carson added yards on the ground as Cincinnati looked to establish a running game. Jeff Driskell provided a bit of a spark and Alex Redmond played well in the Bengals zone-blocking scheme to help Cincinnati take the lead late. Kicker Jonathan Brown also drilled a 55-yard kick. Andy Dalton, in brief duty, was able to make plays with his feet as well as with his arm. Geno Atkins is still the same player we’ve seen in recent seasons, and he leads a stacked Bengals defensive line that should provide problems for nearly every offensive line the Bengals face this season. On the other hand, PFF’s 2018 breakout candidate, CB William Jackson III, was beaten for a touchdown by Terrance Williams. Last season, Jackson didn’t give up a score all season (423 coverage snaps) and surrendered just a 36.1 passer rating when targeted. The biggest story coming out of this game is PFF All-Pro guard Zack Martin going down with a knee injury. Like many teams in the NFL, Dallas has some serious depth issues along the offensive line and that was evident tonight. In the starting rotation, rookie Connor Williams struggled for the second straight week as he adjusts to guard at the pro level as Andrew Billings really gave him trouble and he struggled in space on pull-lead plays. In a bright spot on offense, TE Rico Gathers had the play of the night. He reached over a defender and snagged a Mike White pass that should have been picked off and turned it into a 25-yard gain. PFF favorite, rookie Michael Gallup also flashed, as he led Cowboys’ receivers with five targets. Dallas’ first group on defense was sound during their time on the field as Demarcus Lawrence played well, often giving Bobby Hart too much to handle. Dallas used their speed up front to cause problems for the Bengals’ pass protection. 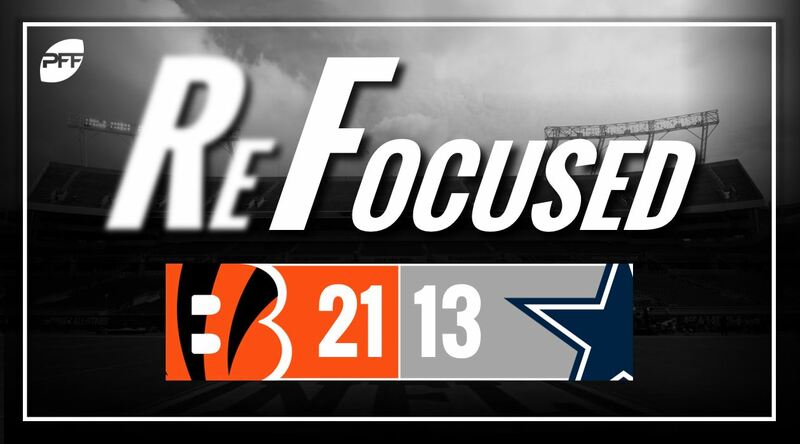 As the game progressed, Cowboys reserves struggled at times in pass coverage allowing the Bengals to come back and gain control of the game. Dallas’ defense missed tackles when given the opportunity to get the Bengals off of the field. Cincinnati: The Bengals defensive line provided consistent and quick pressure in the passing game. Cowboy quarterbacks could not find a rhythm throughout the entire game. Dallas: Dallas pressured the Bengals QBs, but Cincinnati was able to get the ball to some playmakers in spots to avoid negative yards.